So, another thing I often reach for in the summer is a bit of powder foundation. I don’t use it all over, just on the t-zone as an alternative to pressed powder. It gives me that extra bit of coverage for areas where I suffer from a bit of redness. I thought this quick photo comparison between a couple of the Illamasqua Powder Foundations that I own might be useful to some. 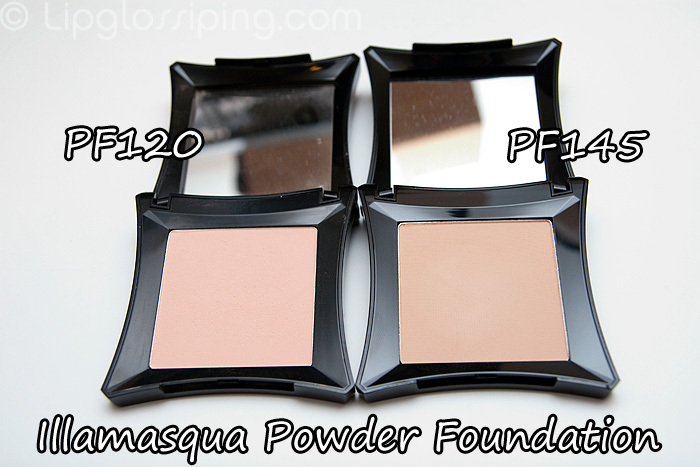 PF120 and PF145 are both fair shades. Of the two, PF120 is paler and pinker. PF145 is a fair, slightly more neutral shade. I can wear both quite easily without fear of going too dark or too orange. I love the packaging, although some may find it a touch cumbersome. Whilst I am enjoying using these, I don’t think I’ll be repurchasing… there’s nothing about them that particularly stands out to me over other great coverage powders. Infact, I prefer my MAC MSF Natural to both of these. Illamasqua Powder Foundation is a sheer/medium coverage powder. If pressed (no pun intended) my favourite thing about this product would be it’s ‘softness’. It feels forgiving to any drier patches I have on my skin and never seems to go cakey, no matter how heavy-handed I get. But for me, the coverage and longevity doesn’t live up to my MSF Natural. Anyway, that was short but (hopefully) sweet. Illamasqua Powder Foundation is priced at £21 each and available from counters nationwide or online at ASOS and Debenhams. What are your favourite Powder foundations? I prefer MSF to this, too, though the powder does smell lovely – kind of candy-sweet. I only bought it because the MAC counter was rammed and I couldn’t get near enough to actually buy the MSF. i have 120 and i LOVE IT! i use it as a finishing powder over one of my fav bb creams i wear. Nothing unfortunately stays matt on me for more than say 4 hours..but this at least doesn’t cake when the oil does get through. How could i find this brand in Kuwait could you tell me , please !